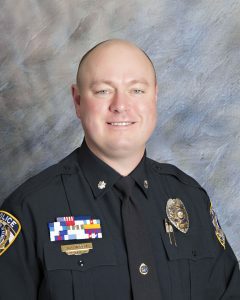 Deputy Chief Jeff Speed is a twenty four year veteran of the Owensboro Police Department and has been a member of the Owensboro Police Department Command Staff since 2004. As a member of the Command Staff, Speed has overseen each division of the Owensboro Police Department. Speed was twice the Commander of the Support Services Division; once from 2004-2006 and then from 2008-2010. Speed was the Commander of the Criminal Investigations Division from 2006-2008, and has been Commander of the Field Services Division, which consists of the Patrol and Criminal Investigations Division from 2010 to 2013. Deputy Chief Speed is a lifelong resident of Owensboro and graduated fromDaviess County High School in 1986. Speed is a graduate of theFBI NationalAcademy, class 236, a graduate of the Criminal Justice Executive Development program, and is a member of the Kentucky Association of Chiefs of Police. Speed holds a Bachelors of Science Degree in Corrections and Juvenile Services from Eastern Kentucky University. He is a 2006 graduate of Leadership Owensboro/Emerge, a board member of The Children’s Advocacy Center, past board member of the local chapter of the American Red Cross, and a member of the National Internal Affairs Investigators Association. The Deputy Chief of Police is the second highest rank in the police department and reports directly to the Chief of Police. The Deputy Chief is assigned as the commanding officer of major organizational components such as the Patrol Division, Detective Division, Public Safety Communications, and Support Services Division. In addition to carrying out specific division duties, the Deputy Chief may assume the duties of the Chief of Police in his absence and perform related functions in that capacity. The Deputy Chief represents the department at community and business meetings to promote the department’s missions and goals in order to foster mutual trust between the community and the department. In addition, the Deputy Chief acts as a Chief of Staff to the office of the Chief of Police and keeps the Police Chief informed of all operational activities on a day-to-day basis. The Deputy Chief, with the assistance of his Division Commanders, is the bridge between strategic initiatives and operational activities within the OPD. The primary goal of the Deputy Chief is to coordinate the activities of all police personnel providing services to the citizens of the city of Owensboro. The crime fighting strategies, the quality of life strategies and the investigative follow-up activities are presented, discussed and further refined at monthly Operational Command Staff meetings held by the Deputy Chief.